E-Zee Weblon No Show 1.5 oz. is a low profile, soft, sheer Cut Away stabilizer that provides low visibility with lightweight fabrics. Made of 100% embossed nylon, it is formaldehyde -free. The low profile, sheer quality prevents the “badge effect” that is common when too heavy a stabilizer is used. Use with high performance wear, knits and loosely woven fabrics. Great for designs up to 8,000 stitches. Two pieces may be used for larger and more dense designs. Cut a piece from a roll or use a piece of pre-cut E-Zee Weblon No Show to fit your hoop size. 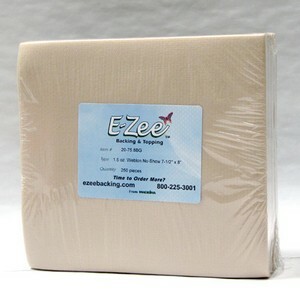 If extra stability is needed, use 2 pieces or add a piece of E-Zee Tear® Lightweight 1.0 oz. stabilizer. To hoop, if using a Tear Away stabilizer, place down first, then sandwich the E-Zee Weblon No Show between the garment on top and the E-Zee Tear Away stabilizer. Embroider the design and remove the embroidered item from the hoop. Tear off the excess Tear Away stabilizer first. Trim the excess E-Zee Weblon No Show stabilizer with scissors.